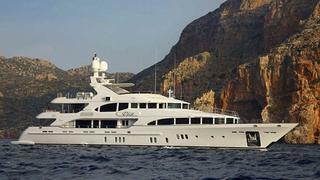 The 44 metre motor yacht Vica has been listed for sale by Marco Fiorani at Yachting Experts. Built in GRP by Italian yard Benetti to a design by Stefano Righini, she was delivered in 2010 as one of the yard's Vision series. MCA compliant, her interior by Francois Zuretti accommodates 12 guests in five cabins consisting of a full beam master suite on the main deck while below there are two VIP suites and two twins, all with televisions and full en suite facilities. On the main deck can be found a large saloon complete with a wet bar and comfortable seating, all illuminated with natural daylight streaming in through large windows allowing magnificent panoramic views. The full beam sun deck offers a large, highly enjoyable area for relaxing, with a table and chairs that can accommodate up to 10 people for informal al fresco dining. This deck comes complete with a large Jacuzzi tub located towards the stern and twin 1,300hp Caterpillar engines give her a range of 4,000 nautical miles at 12 knots. Vica is asking €15.5 million.